Picture shows, front row, left to right is Gary Cameron (Creative Scotland), Caroline Warburton (Visit Scotland), Stewart Murdoch (Leisure and Culture Dundee), Lesley Toles (Fife Cultural Trust), Billy Gartley (Leisure and Culture Dundee), Kirsty Hunter (ANGUSalive) and Philip Long (Director, V&A Dundee). Back row, left to right is Dame Seona Reid (Heritage Lottery Fund), Pamela Reid (Ekosgen), Michelle Sweeney (Fife Cultural Trust), Heather Stuart (Fife Cultural Trust), Ríona McMorrow, (Heritage Lottery Fund Scotland) and Helen Smout (Culture Perth and Kinross). Representatives from groups across from Tayside and Fife descended upon the Steps Theatre, in Dundee Central Library, for the first Tay Cities Cultural Summit. Groups such as Leisure and Culture Dundee, V&A Dundee, Fife Cultural Trust, Angus Alive, Culture Perth and Kinross and VisitScotland sent senior staff to the event. The day included discussions on the impact of V&A Dundee on the city, how to strengthen regional collaborations and how to support volunteers. Keynote speaker Bridget McConnell, chief executive of Glasgow Life, gave a personal overview of her experiences in Glasgow and how they can be transferred the Tayside area. 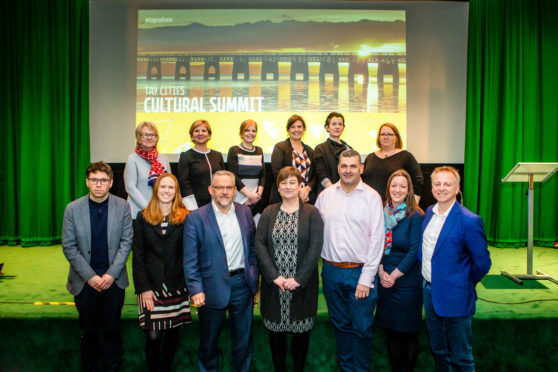 Kirsty Hunter, Angus Alive chief executive, said: “There’s been significant planning between the charitable trusts with a culture remit in Angus, Dundee, Fife and Perth and Kinross to deliver together today’s culture summit. “I think it’s been an excellent day with a diverse agenda and speakers that have provoked an engaging discussion about how the cultural sector can continue to be a key driver of economic, social and wellbeing benefits for our communities. “It’s been really encouraging and people have been asking a lot of questions and have demonstrated they are committed to working in partnership to achieve shared outcomes. “Public sector funding is under significant pressure at the moment and the traditional funding mechanisms are not something we can continue to rely on as the only or main source of funding in future. Stewart Murdoch, Leisure and Culture Dundee chief executive, said: “This is the first event that has brought culture organisations from across the Tayside area together. Heather Stuart, chief executive of Fife Cultural Trust, chaired a panel featuring Gary Cameron from Creative Scotland, Lucy Casot from Museums Galleries Scotland and Dame Seona Reid, retiring chairwoman of the National Lottery Heritage Fund Scotland. The panel fielded questions from the audience and covered topics such as volunteer workers and how to work across different regions. Ms Stuart said: “I think the quality of the debate was excellent. There was some challenging questions.